The Spotted Sunfish are covered with small black spots. The spots on the body are very evenly distributed in horizontal rows giving the breast of the sunfish a very distinct look once you have seen a few of them. The color of Lepomis punctatus can range in color from black to red-orange males to yellow-brown in the females. 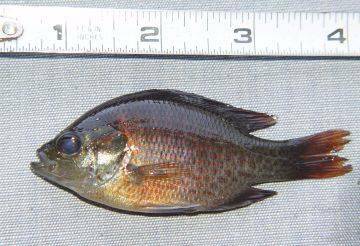 Not a very large sunfish so it is rarely kept by recreational fisherman.